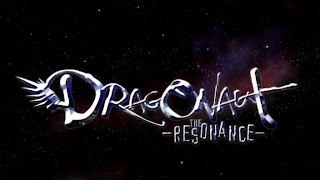 The MOA: The Melancholy of Anime: Drama and Dragons and Vampires Oh MY!! Here it is! The completion of 6 animé!! This post will spill my thoughts on animé I've just completed to date!! 6 times the animé! 6 times the blog! As soon as I watched the first episode, I knew I was going in for a long ride. But I didn't expect it to be a 24 episode drama-fest. Slow. Slow, but also enjoyable. But slow. Kendo? - This series must have alot of action! Girls? - This series must have alot of fanservice! Unfortunately (, and fortunately), it had neither. It was a fun little show barely drifting storywise throughout the season. 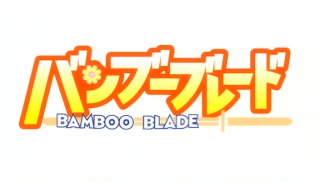 Rather than an action-animé like the ones I'm so used to, it was VERY laid back. And unlike my 'fanservice' pre-thoughts, it's comedy kept my mind occupied from the gutter. Extremely fun to watch. Also, the last few episodes were really something. Episode 25 pretty much summed the series nicely, while 26 was an epilogue, showing us that although the shows technically over, there's always room for more. I definitely wouldn't mind a second season with whoever that girl Tama looked in the eyes. RAIBARU! I REALLY think Kirino likes Ishida-sensei. That's cute and all, but DAMN IT!! I called her first! Spunky, yes, but the story wavers all over the place. And not in an, "OMFG HARUHI IS WIN CAUSE IT MAKES ALMOST NO SENSE!!!" waver either, but still fun! THIS, here viewers, is an animé from the result of picking words from a hat and trailing a story with just those material. But the thing that surprises me is the fact that they took EVERY popular generic theme, mashed it up, and decided, "Hey! Instead of making this completely generic, let's twist the story here and there to give it a little oomph!" Enter the Power of Love! I don't even know what to say during the time I've been watching (and sometimes even fast forwarding) this series. Some episodes left me thinking "omg!1", and some episodes left me thinking "wtf!?". Seriously, even when he had a hot dragon woman girl, his mind was still in the gutter south of 'Jin avenue'. The last episode was entering, "Hell, we've tried everything, so let's add a little Gurren Lagann flavor in it for the end!" so they throw in the 'alternate universe to keep you in a peaceful trance for all eternity' trap, like in Gurren, but ultimately fails, like in Gurren. It would've been a two-handed clap if they did it before Gurren. And as that guy who they presumably killed a while back is revived(? ), I realize that I don't remember anything that's happened these past 24 episodes. No, fast forwarding wasn't the reason. I guess there just wasn't enough interesting substance for me to bother memorizing. Kamina--er, Akira and Machina--um, Thanatos...whatever. I guess the good of the series was that the very ending, the whole "Become one with *insert supreme entity here* and you'll never feel bad feelings again :)", was beaten by the single thought, "But I don't want to be alone :'(". A train wreck by some, a roller coaster ride of ratings by myself, it wasn't actually that bad to watch! Almost on Code Geass-epicness, this series has a few surprises around every corner, when they're not trying too hard. There were alot of things that left me clawing up the wall in my room. The story was TOO shallow. The creator never wanted to think too deeply to allow any good logic! 1st off: Some sort of nun walking in the middle of the night drops a pamphlet of a school some drunkard notices, picks up, and enrolls his son into knowing nothing about said school? 2nd: A school of monsters, and on the first day, they're suspicious of you being a human? For me, I don't own a big book on monsterology or something, but I think you'd want to at least lie about what you are. Personally, I'd go with a doppelganger, since it physically seems to be VERY human. -Tsukune (I hate the name, btw. I unno, seems weird.) dies. Oh no. He died fighting a monster. Again. -Tsukune becomes a vampire. Hmm...the only monsters that can turn others to monsters are generally vampires and werewolves. 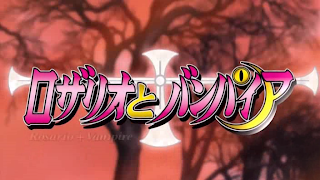 I was actually hoping for werewolf for the diversity, but then again it would require this animé to be original, dear me! I'm always for romantic comedies with supernatural harems, but it needs a little more spice! 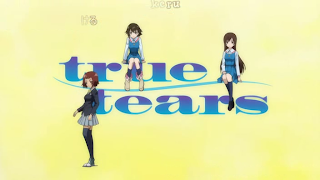 True Tears is definitely one of the better animé I've seen. It's been a rollerride of drama, leaving my jaw on the floor after every episode! I'm sad that this animé's finally ended, but I couldn't be more satisfied the way it ended, properly, something animé nowadays has been neglecting to strive for. Side Comment: Who would YOU choose? Hiromi? Noe? Or even Aiko? Okay, if Haruhi is like a big cup of hot coffee to jumpstart your day, this series is like a nice cup of tea on a nice quiet evening: different spectrum, same satisfaction. I honestly didn't think this series would span a year! I thought somewhere around 26 eps, tops! But at the same time, it's quite expected that a series with alot of material, no venturing story, and unlimited gags, can last a long time! Kind of like Gintama! This animé itself wasn't really something I stayed tuned to see the first chance I get. It was more of those relaxation periods from a long day of...whatever tires you out. Even f I get a hold of an episode, I may not watch them until they clump to 3 or even 5 episodes, but I'll still finish them. It was definitely a good series, but it's more the type for someone who wants to watch animé for the sake of just watching animé. Nothing captivating about it. Definitely something that's kept me entertained through out 2007! And is there really a Season 2!? HONTO!! ?